Decorative set of 4 wooden boxes with unique designs on each box. Boxes fit into wooden tray. 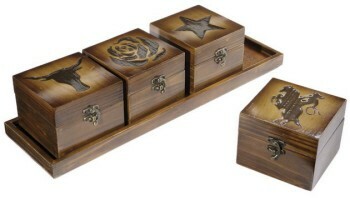 One of each design- rose, star, cowboy and longhorn are laser cut onto wooden boxes with a matching wooden tray. Each box has hinges and latch.